With fall around the corner, thoughts turn to comfort dishes. Nothing like mac ‘n cheese for the quintessential comfort dish. With the addition of roasted poblano peppers, bacon and a crumb topping this dish will appeal to adults and kids alike. The poblanos add very mild heat to the dish. To kick it up a notch, use hotter peppers such as Italian or Hatch peppers. 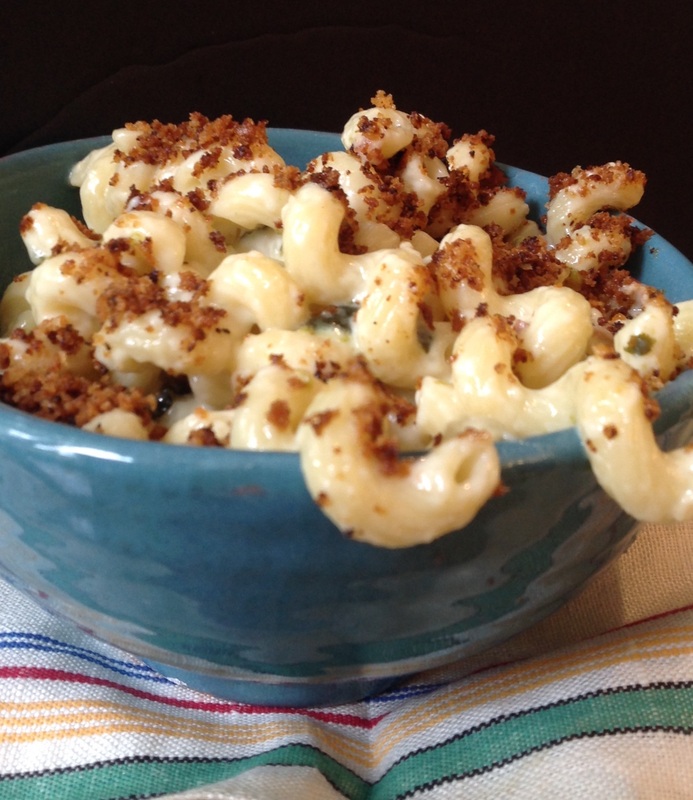 The mac’ n cheese is rich and creamy with layers of smokey flavors. Easy to make, it is a perfect marriage of creaminess and depth of flavor imparted from the smokey bacon and peppers. Using a larger corkscrew pasta rather than traditional macaroni really increases the ratio of creamy cheese sauce to pasta. 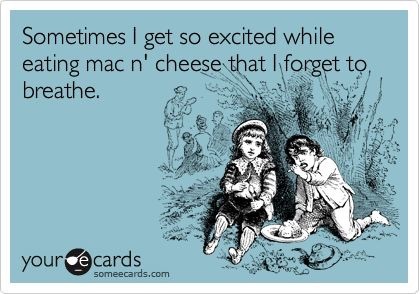 In mac’n cheese, that is a very good thing! 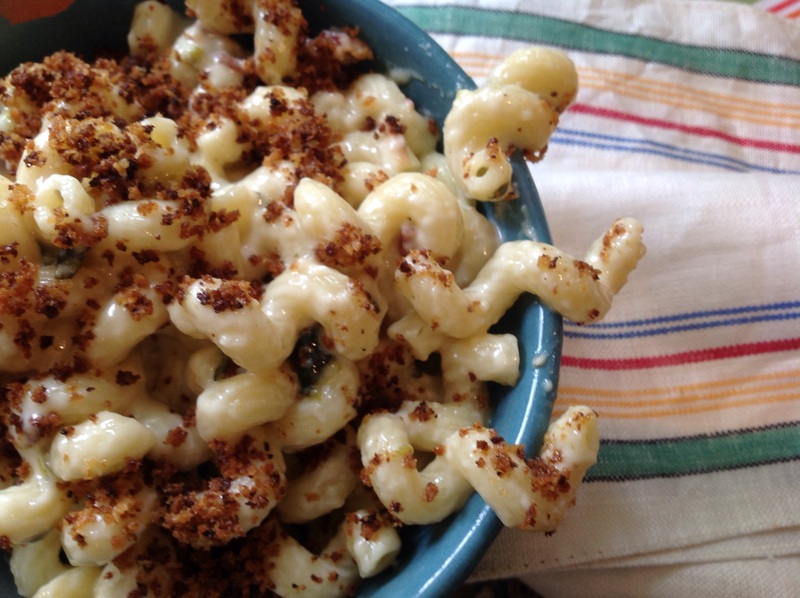 This mac’n cheese is fancy enough to serve to company, if you’re willing to share! Adapted from Hostess at Heart See the original recipe here. To roast the peppers, place them on a baking sheet in a 400 F oven and cook for 10 minutes, turning once. The skin should be blackened. Place in a paper bag to sweat. Once cooled, peel off the skin and discard the seeds and stems. I wore rubber gloves to work with the peppers. In a large skillet, melt the butter and add the Panko bread crumbs and stir non stop until the crumbs are golden brown. Remove from heat and reserve. In another large skillet, bring the cream to a boil, and continue cooking until it is reduced and thickened slightly. Stir in 1/4 c pasta water. Add garlic, cheese, bacon and peppers. Stir in another 1/4 cup of the pasta water if sauce is too thick. Taste and adjust for salt and pepper. Add drained pasta and coat with sauce. To serve, sprinkle each bowl with the toasted Panko bread crumbs. 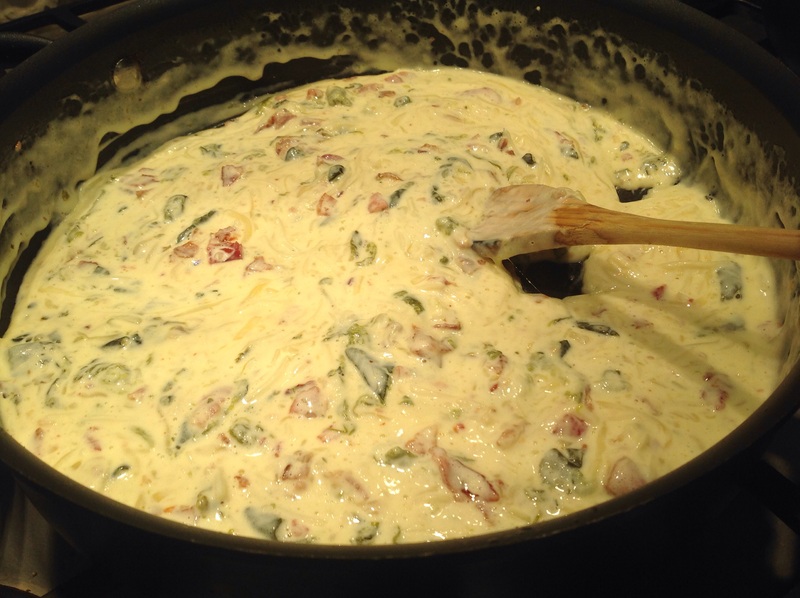 Stir the whole mixture of butter, cream, garlic, bacon, peppers and add pasta water to desired thickness. Add the pasta to the sauce and stir to coat evenly. 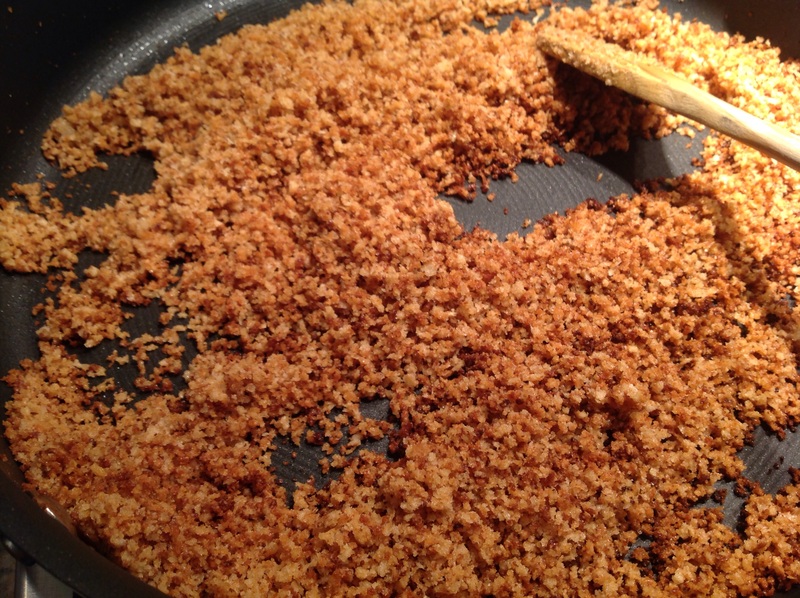 Top with a sprinkling of toasted Panko crumbs. 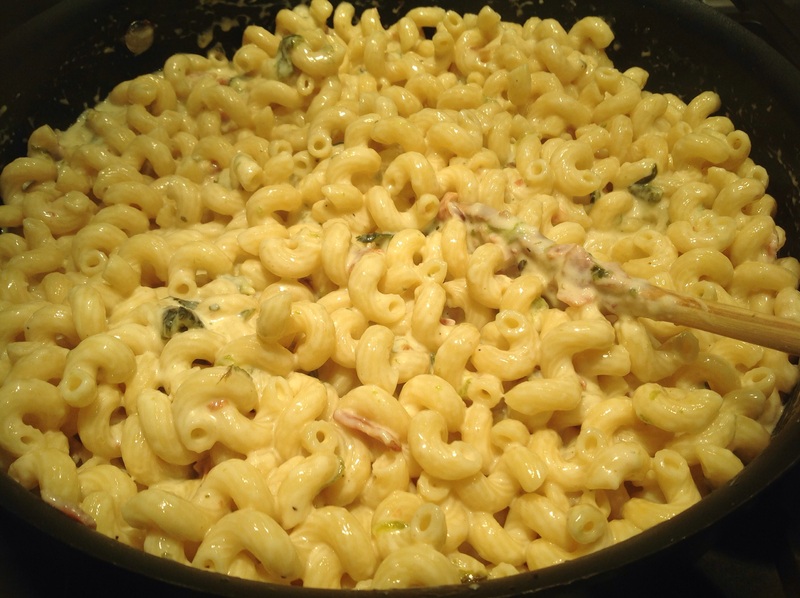 This entry was posted in Uncategorized and tagged bacon mac and cheese, bacon mac and cheese with roasted peppers, Bacon mac n cheese, Mexican mac'n'cheese, spicy bacon mac n cheese by Johanne Lamarche. Bookmark the permalink. Hi HOLLY! I know you’ll love it! Nice to hear from you. Beautiful job! You even got the bread crumbs shot! I am very glad that you enjoyed it, and appreciate the shout out. Have a wonderful day! Thanks Julie! I added garlic too. BUT had to make your %€^>€€€€ meatballs Monday and had a request for another batch to bring to college son this w/e. I have NEVER made a dish so often! LOL! I loved the M ‘n C! Could not find hatch chilies anywhere. Will keep looking. I was going to make this too!! Love the poblano. 🙂 Looks delicious! You’ll love it Josette! The creaminess is spot on and it seemed so fast compared to other scratch M’n C recipes . I halved the bread crumbs and added garlic. Julie said it did make too large a quantity of crumbs. I hope you can find the hatch. Internet said poblanos were substitute for them but they are pretty mild seeded and peeled. We loved their smokiness. Swoon- worthy! Best comment ever Jenna! I don’t know if I’d be willing to share a dish that looks this mouthwatering!! I love the addition of roasted poblanos – what a great twist on a classic comfort food. Oh my gosh~I have no words~I can’t wait to try this! If you didn’t already have me at mac and cheese, the poblano sealed the deal!!! I know you like heat so feel free to add more poblanos or even a hotter pepper. Julie at Hostess at Heart used Hatch peppers but I could not find them. This dish vanished and all I got was a taste! Who ever turns down a good mac n’ cheese – not me! You are in good company Judi!